It’s not only the Sun’s rays that are needed to create solar energy. For this renewable energy source to be sustainable in the decades to come requires an adequate supply of water, as water is required to clean solar panels and mirrors as well as to cool solar thermal power plants. In the desert regions, however, water is a scarce resource. 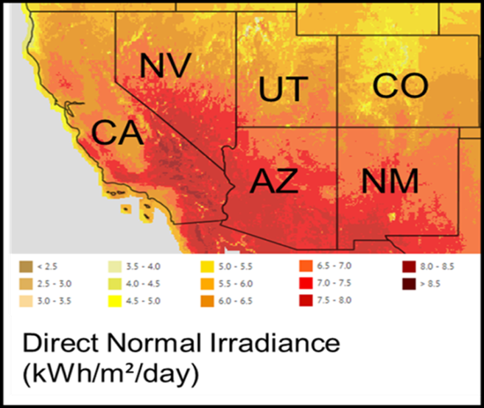 Consequently to determine if solar power is sustainable in such regions, NEXUS researchers have been analyzing the water requirements of solar energy development and the availability of water resources for future solar development in Nevada. The NEXUS scientists have also been investigating technologies that will produce solar power while minimizing water use. The sunny southwestern U.S. possesses tremendous potential for capitalizing on solar energy, but for the lack of water. To understand whether this region could support sustainable solar energy development NEXUS scientists Batista and Dr. Sajjad Ahmad at UNLV developed a simulation model for analyzing water and land needs for utility-scale solar development in six southwestern states of the U.S. from 2015 to 2030. The model was designed to estimate the on-site water and land-use requirements for solar deployment in the southwestern U.S. and to analyze how these demands compared against the water and land availabilities for the 19 solar energy zones in these states. The Bureau of Land Management (BLM) defines a solar energy zone as an area well suited for utility-scale production of solar energy—an area where the BLM will prioritize solar energy development. 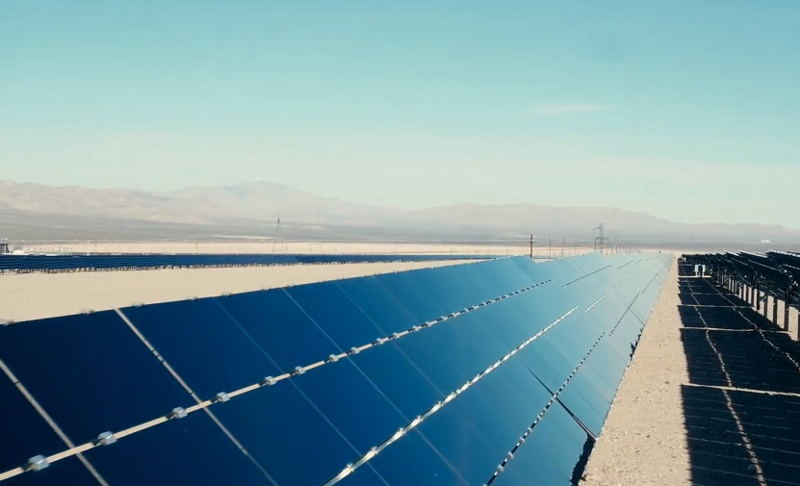 The analysis revealed that there was no unallocated surface water available for solar power in any of the 19 solar zones, although there was some groundwater available in Nevada and Utah. Successful solar deployment in Arizona, California, Colorado and New Mexico will depend on water that has already been allocated for alternate uses, treated wastewater or brackish water resources. States can use this model in their attempts to meet renewable portfolio standards, by estimating the water and land requirements of various configurations of solar plant types, Batista says. Decision makers can use this model to make water allocation decisions among different industry types, including solar energy. While energy generation requires water, treating and transporting water also requires energy. The scientists then went on to analyze the water-energy nexus of three small, medium and large drinking water treatment plants located in the southwestern U.S. Their research evaluated how much energy these plants consumed and whether it was feasible to use solar photovoltaic (PV) panels to provide some of the energy required. From performing this analysis the scientists found that being able to store some of the solar energy generated, using batteries, proved critical if solar energy was used at water treatment plants. “Because solar energy generation only occurs during the day time, to assure water treatment plants can operate for the time needed, it is important that these plants, if operated with solar, have energy storage to make this source reliable,” Batista says. An alternative to energy storage could be to hook the plant up to the grid and only draw energy from it when the solar system does not generate sufficient energy, Batista says. NEXUS research performed has demonstrated that integrating several energy sources is feasible to increase reliability of energy infrastructure. The methodology that the scientists have developed to estimate the energy consumption can be used by any water treatment plant, wishing to benchmark their energy use and considering to implement solar, Batista says. NEXUS researchers haven’t just looked at the water needs of renewable energy sources, they have also looked at how water itself can generate energy. In every water delivery system throughout the United States, pressure-reducing values (PRVs) continually lower the high pressure of water so that it is suitable for customer use. NEXUS scientist Dr. Mehdi Etezadi-Amoli, at the University of Nevada, Reno (UNR) is investigating the potential for this process to also generate electrical power, using waste energy from the reduction process. To do this Etezadi-Amoli and his UNR team have looked at the efficiency of the water delivery system in Northern Nevada and proposed a scheme to convert the wasted energy into electricity. By converting the electrical power into Direct Current (DC), the researchers can store energy in batteries, so that it can be used later to provide fixed power. Alternatively, the energy can be converted into alternating current (AC) to be pumped back to the power company or the distribution system. As water can be scarce in desert environments, NEXUS scientists have investigated the use of impaired waters and other sources of water that ordinarily would not be used for potable purposes in solar energy production. But using such water resources requires them to be “cleaned” and cleaning water is a process that requires energy. To address this challenge, NEXUS researcher Dr. Sage Hiibel and his UNR team have developed an ingenious technology that supports both solar energy and water treatment. This technology uses waste heat from solar energy generation to power water treatment and the treated water for cleaning and other on-site needs. The NEXUS technology hinges on a process called direct contact membrane distillation (DCMD), an emerging water treatment technique that can be used to treat many non-potable waters. In the symbiotic technology, waste heat from a solar energy facility supplies the energy required to warm impaired waters that are then processed through membranes to produce purified water that can be used to clean the solar panels or mirrors. Expanding on the symbiosis between solar energy and water, Batista and Ahmad have also investigated using solar energy to pump shallow brackish groundwater to generate freshwater that could be used for solar energy generation or other purposes. Groundwater aquifers that lie deep beneath the land surface already supply 15% of the Las Vegas water requirements. Now scientists are questioning whether shallow groundwater, which typically contains more salts and is known as brackish water, also has the potential to provide much needed water for human and industrial use. To generate usable water from a shallow source it is necessary to pump and to treat that water, as it typically contains high levels of total dissolved solids. Desalination techniques can remove dissolved solids from such brackish water to produce freshwater but it’s an energy-intensive process. To test whether using solar energy to pump and treat shallow groundwater may be a viable option the NEXUS scientists have investigated the costs and benefits of using energy generated from solar PV panels to pump and desalinate a brackish shallow groundwater source in the Las Vegas Valley using a model. The researchers findings imply that solar power was capable of supplying the energy for desalination of the shallow groundwater but constructing a solar plant of the required size might not always be feasible. But the team did find that using solar power to fuel the freshwater generation, instead of a fossil fuel energy source, made for a reduction of carbon emissions to the tune of 4,700 metric tons of carbon dioxide a year in the Las Vegas valley. “Although the cost of pumping and treating brackish water with solar energy may not be significantly cheaper, there are intangible benefits associated with the process such as decreased carbon dioxide emissions, and an additional secure water source,” Batista says. A significant achievement in the water sector of the NEXUS project has been the building of the Nevada Solar-Water Express—a trailer that can be taken to solar facilities around the region of Las Vegas, which houses the technology to treat and clean water onsite. Due to the remoteness of most large-scale solar facilities, bringing fresh clean water in and taking the dirty water out would be incredibly expensive but on-site treatment cuts the associated transportation costs completely. The trailer also has a dual purpose: To raise Science, Technology, Engineering and Mathematics (STEM) awareness for students. As well as housing the water-cleaning technology it contains several other water treatment technologies. The Nevada Solar-Water Express has a six-foot awning window for demonstrations, fixed bench-space, a small wet-lab area, module areas for the various technologies, and photovoltaic panels on the roof to demonstrate solar energy systems. Using this trailer, NEXUS scientists are able to take science to the students in schools, colleges and universities and raise awareness about what is possible in Nevada. The researchers also use it to build collaborations with other agencies and researchers, and help inform the public about the potential for water savings and renewable energy in the state. “Our NEXUS scientists are making significant contributions to the Department of Energy’s Energy-Water Nexus Challenge by developing crosscutting technology, demonstration and deployment opportunities within the system of water and energy flows” says Dr. Gayle Dana, NEXUS Project Director. NEXUS Notes is a monthly publication of the Solar Nexus Project, which is a five-year research project funded by the National Science Foundation’s Established Program to Stimulate Competitive Research “EPSCoR” (Cooperative Agreement #IIA-1301726) focusing on the nexus of (or linkage between) solar energy generation and Nevada’s limited water resources and fragile environment. ACKNOWLEDGEMENT: This material is based upon work supported by the National Science Foundation under Grant No. IIA-1301726. DISCLAIMER: Any opinions, findings, and conclusions or recommendations expressed in this material are those of the author(s) and do not necessarily reflect the views of the National Science Foundation.